One the United States' strongest and most technologically advanced allies in Asia is stepping up its role in regional security, and for sailors it could mean a lot more exercises and exchange programs, experts say. Troubled by the recent rise of a more assertive China, Japan has signaled made a series of moves in recent weeks that signals a sea change in a long-standing armed forces policy of strictly self-defense dating back to the end of World War II. Japan's top admiral said officer told The Wall Street Journal in June that his forces were open to the idea of going on patrols in the South China Sea with the U.S., something the U.S. has been pushing Japan to do for some time. Adm. Katsutoshi Kawano, chief of the Joint Staff of the staff of the Japanese Self-Defense Force, said the recent actions by China — including aggressive moves like creating an air identification zone in the East China Sea and building artificial islands in the South China Sea —in an attempt to claim rights to the surrounding resources, have been worrisome and that Japan is reassessing how it approaches its fraught relationship with its larger neighbor. "In the case of China, as we can see with the South China Sea problem, they are rapidly expanding their naval presence and their defense spending is still growing," Kawano told The Wall Street Journal. "Also because there is a lack of transparency, we are very concerned about China's actions." In addition to the potential patrols, the Japanese have been in discussions with the Philippines for a visiting forces agreement, similar to the one brokered between the U.S. and the Philippines last year, which would allow Japan to use some Philippine military facilities. This is a remarkable change, that comes after decades of hard feelings toward Japan stemming from their brutal occupation of the island nation during World War II. changedevelopment because the Japanese conquered the Philippines in 1941. It was liberated at great cost by the American military in 1945 at the end of the war. Japan's emerging commitment to regional security beyond its territorial waters could mean more opportunities for sailors to work with the Japanese Maritime Self-Defense Force, said former top NATO officer retired Adm. James Stavridis, who served as NATO Supreme Allied Commander Europe. "Japan is like us in that it is, at its core, a maritime power," Stavridis said. 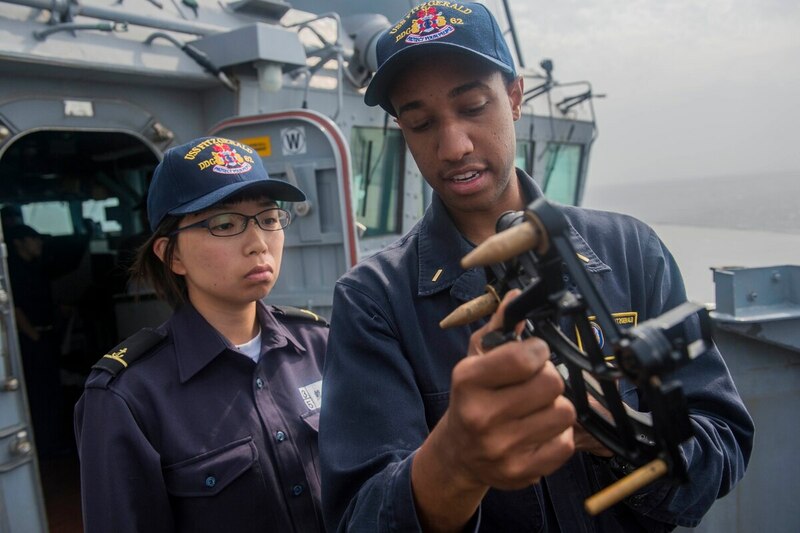 "I think sailors can expect an upgraded set of exercises, technology exchanges, sailor exchanges, and an even more welcoming sense for U.S. forces in Japan. Overall I think it's very positive." Many Japanese feel peoplehave been increasingly threatened by China, and those concerns have been reflected in the politics of Prime Minister Shinzo Abe, said Stavridis, who now serves as dean of the Fletcher School of Law and Diplomacy at Tufts University. "Shinzo Abe has been much more assertive and forward leaning than his predecessors going all the way back to the World War II," he said. Abe has been controversial in the region. His views on the Japanese role in WWII have angered many Chinese and Korean people, including those old enough to remember atrocitiesexcesses committed by Japanese troops in the conflict. For this reason, Japan and the U.S. will have to tread lightly, said Lawrence Korb, a former assistant defense secretary for manpower, reserve affairs, installations and logistics. "You have to be very careful the way this is played," said Korb, who is now an analyst with the Center for American Progress in Washington, D.C. "When you travel to China and you talk to them, they'll tell you things like, 'You don't understand the Japanese.' It's like 1939 was yesterday to them. They'll say we don't understand what they did what [the Chinese people] went through." Since the end of World War II, Japan has ve been a strongly pacifist country. In 1947, the country adopted a new constitution that made going to war for any other reason than self-defense illegal. Korb said that the U.S. has been seeking to get Japan to take a more active role in regional security as far back as the Reagan administration, when he was during his time at the Pentagon. The inclusion of Japan in regional security efforts would be a great help to the U.S., which has been the main cop on the beat in the Asia-Pacific since the 1940s. Japan has one of the world's largest navies, with more than 120 ships to include destroyers, amphibs and attack submarines. Japan's latest moves signal that those ships could sail with U.S. ships and task forces, like the forward-deployed carrier strike group based in Japan. China's recent aggressive actions in the South China Sea, including creating anthe air identification zone over islands claimed by Japan at the end of 2013, have spurred Japan into a more assertive posture, but China has also managed to tick off just about every one of its neighbors in one way or another. The result has been that countries like the Philippines, a U.S. ally, and even erstwhile enemies like communist Vietnam, have turned to the United States for forceful backup. That's a win for the U.S., Korb said. "In the long run what the Chinese have done is revitalize all those countries to work with us," Korb said. "Just look at the Philippines: The Philippines kicked us out in the early 1990s and now they want us back." But even with more willing partners in the Pacific, Stavridis said the situation is as dangerous as any the U.S. faces today. "Even more so than the Middle East or Europe, the risk of great power conflict is greater in that region than anywhere else in the world."